The lens is part of the anterior segment of the human eye. In front of the lens is the iris, which regulates the amount of light entering into the eye. 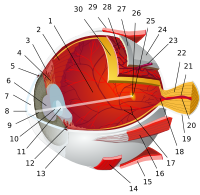 The lens is suspended in place by the suspensory ligament of the lens, a ring of fibrous tissue that attaches to the lens at its equator and connects it to the ciliary body. 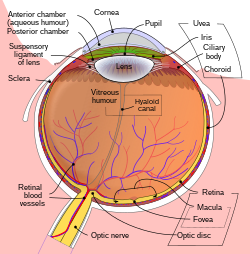 Posterior to the lens is the vitreous body, which, along with the aqueous humor on the anterior surface, bathes the lens. The lens has an ellipsoid, biconvex shape. The anterior surface is less curved than the posterior. In the adult, the lens is typically circa 10 mm in diameter and has an axial length of about 4 mm, though it is important to note that the size and shape can change due to accommodation and because the lens continues to grow throughout a person's lifetime. The lens has three main parts: the lens capsule, the lens epithelium, and the lens fibers. The lens capsule forms the outermost layer of the lens and the lens fibers form the bulk of the interior of the lens. The cells of the lens epithelium, located between the lens capsule and the outermost layer of lens fibers, are found only on the anterior side of the lens. The lens itself lacks nerves, blood vessels, or connective tissue. The lens capsule is a smooth, transparent basement membrane that completely surrounds the lens. The capsule is elastic and is composed of collagen. It is synthesized by the lens epithelium and its main components are Type IV collagen and sulfated glycosaminoglycans (GAGs). The capsule is very elastic and so allows the lens to assume a more globular shape when not under the tension of the zonular fibers (also called suspensory ligaments), which connect the lens capsule to the ciliary body. The capsule varies from 2 to 28 micrometres in thickness, being thickest near the equator and thinnest near the posterior pole. The lens epithelium, located in the anterior portion of the lens between the lens capsule and the lens fibers, is a simple cuboidal epithelium. 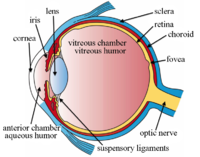 The cells of the lens epithelium regulate most of the homeostatic functions of the lens. As ions, nutrients, and liquid enter the lens from the aqueous humor, Na+/K+-ATPase pumps in the lens epithelial cells pump ions out of the lens to maintain appropriate lens osmotic concentration and volume, with equatorially positioned lens epithelium cells contributing most to this current. The activity of the Na+/K+-ATPases keeps water and current flowing through the lens from the poles and exiting through the equatorial regions. The lens fibers form the bulk of the lens. They are long, thin, transparent cells, firmly packed, with diameters typically 4–7 micrometres and lengths of up to 12 mm long. The lens fibers stretch lengthwise from the posterior to the anterior poles and, when cut horizontally, are arranged in concentric layers rather like the layers of an onion. If cut along the equator, it appears as a honeycomb. The middle of each fiber lies on the equator. These tightly packed layers of lens fibers are referred to as laminae. The lens fibers are linked together via gap junctions and interdigitations of the cells that resemble "ball and socket" forms. The lens is split into regions depending on the age of the lens fibers of a particular layer. Moving outwards from the central, oldest layer, the lens is split into an embryonic nucleus, the fetal nucleus, the adult nucleus, and the outer cortex. New lens fibers, generated from the lens epithelium, are added to the outer cortex. Mature lens fibers have no organelles or nuclei. Development of the human lens begins at the 4 mm embryonic stage. Unlike the rest of the eye, which is derived mostly from the neural ectoderm, the lens is derived from the surface ectoderm. The first stage of lens differentiation takes place when the optic vesicle, which is formed from outpocketings in the neural ectoderm, comes in proximity to the surface ectoderm. The optic vesicle induces nearby surface ectoderm to form the lens placode. At the 4 mm stage, the lens placode is a single monolayer of columnar cells. As development progresses, the lens placode begins to deepen and invaginate. As the placode continues to deepen, the opening to the surface ectoderm constricts and the lens cells forms a structure known as the lens vesicle. By the 10 mm stage, the lens vesicle has completely separated from the surface ectoderm. After the 10 mm stage, signals from the developing neural retina induces the cells closest to the posterior end of the lens vesicle begin to elongate toward the anterior end of the vesicle. These signals also induce the synthesis of crystallins. These elongating cells eventually fill in the lumen of the vesicle to form the primary fibers, which become the embryonic nucleus in the mature lens. The cells of the anterior portion of the lens vesicle give rise to the lens epithelium. Additional secondary fibers are derived from lens epithelial cells located toward the equatorial region of the lens. These cells lengthen anteriorly and posteriorly to encircle the primary fibers. The new fibers grow longer than those of the primary layer, but as the lens gets larger, the ends of the newer fibers cannot reach the posterior or anterior poles of the lens. The lens fibers that do not reach the poles form tight, interdigitating seams with neighboring fibers. These seams are readily visible and are termed sutures. The suture patterns become more complex as more layers of lens fibers are added to the outer portion of the lens. The lens continues to grow after birth, with the new secondary fibers being added as outer layers. New lens fibers are generated from the equatorial cells of the lens epithelium, in a region referred to as the germinative zone. The lens epithelial cells elongate, lose contact with the capsule and epithelium, synthesize crystallin, and then finally lose their nuclei (enucleate) as they become mature lens fibers. From development through early adulthood, the addition of secondary lens fibers results in the lens growing more ellipsoid in shape; after about age 20, however, the lens grows rounder with time and the iris is very important for this development. Several proteins control the embryonic development of the lens: among these, primarily, PAX6, considered the master regulator gene of this organ. Other effectors of proper lens development include the Wnt signaling components BCL9 and Pygo2. In many aquatic vertebrates, the lens is considerably thicker, almost spherical, to increase the refraction. This difference compensates for the smaller angle of refraction between the eye's cornea and the watery medium, as they have similar refractive indices. Even among terrestrial animals, however, the lens of primates such as humans is unusually flat. In reptiles and birds, the ciliary body touches the lens with a number of pads on its inner surface, in addition to the zonular fibres. These pads compress and release the lens to modify its shape while focusing on objects at different distances; the zonular fibres perform this function in mammals. In fish and amphibians, the lens is fixed in shape, and focusing is instead achieved by moving the lens forwards or backwards within the eye. In cartilaginous fish, the zonular fibres are replaced by a membrane, including a small muscle at the underside of the lens. This muscle pulls the lens forward from its relaxed position when focusing on nearby objects. In teleosts, by contrast, a muscle projects from a vascular structure in the floor of the eye, called the falciform process, and serves to pull the lens backwards from the relaxed position to focus on distant objects. While amphibians move the lens forward, as do cartilaginous fish, the muscles involved are not homologous with those of either type of fish. In frogs, there are two muscles, one above and one below the lens, while other amphibians have only the lower muscle. In the most primitive vertebrates, the lampreys and hagfish, the lens is not attached to the outer surface of the eyeball at all. There is no aqueous humor in these fish, and the vitreous body simply presses the lens against the surface of the cornea. To focus its eyes, a lamprey flattens the cornea using muscles outside of the eye and pushes the lens backwards. The lens is flexible and its curvature is controlled by ciliary muscles through the zonules. By changing the curvature of the lens, one can focus the eye on objects at different distances from it. This process is called accommodation. At short focal distance the ciliary muscle contracts, zonule fibers loosen, and the lens thickens, resulting in a rounder shape and thus high refractive power. Changing focus to an object at a greater distance requires the relaxation of the lens and thus increasing the focal distance. The refractive index of human lens varies from approximately 1.406 in the central layers down to 1.386 in less dense layers of the lens. This index gradient enhances the optical power of the lens. Aquatic animals must rely entirely on their lens for both focusing and to provide almost the entire refractive power of the eye as the water-cornea interface does not have a large enough difference in indices of refraction to provide significant refractive power. As such, lenses in aquatic eyes tend to be much rounder and harder. Graph showing optical density (OD) of the human crystalline lens for newborn, 30-year-old, and 65-year-old from wavelengths 300-1400 nm. Crystallins are water-soluble proteins that compose over 90% of the protein within the lens. The three main crystallin types found in the human eye are α-, β-, and γ-crystallins. Crystallins tend to form soluble, high-molecular weight aggregates that pack tightly in lens fibers, thus increasing the index of refraction of the lens while maintaining its transparency. β and γ crystallins are found primarily in the lens, while subunits of α -crystallin have been isolated from other parts of the eye and the body. α-crystallin proteins belong to a larger superfamily of molecular chaperone proteins, and so it is believed that the crystallin proteins were evolutionarily recruited from chaperone proteins for optical purposes. The chaperone functions of α-crystallin may also help maintain the lens proteins, which must last a human for his/her entire lifetime. Another important factor in maintaining the transparency of the lens is the absence of light-scattering organelles such as the nucleus, endoplasmic reticulum, and mitochondria within the mature lens fibers. Lens fibers also have a very extensive cytoskeleton that maintains the precise shape and packing of the lens fibers; disruptions/mutations in certain cytoskeletal elements can lead to the loss of transparency. The lens blocks most ultraviolet light in the wavelength range of 300–400 nm; shorter wavelengths are blocked by the cornea. High intensity ultraviolet light can harm the retina, and artificial intraocular lenses are therefore manufactured to also block ultraviolet light. People lacking a lens (a condition known as aphakia) perceive ultraviolet light as whitish blue or whitish-violet. The lens is metabolically active and requires nourishment in order to maintain its growth and transparency. Compared to other tissues in the eye, however, the lens has considerably lower energy demands. By nine weeks into human development, the lens is surrounded and nourished by a net of vessels, the tunica vasculosa lentis, which is derived from the hyaloid artery. Beginning in the fourth month of development, the hyaloid artery and its related vasculature begin to atrophy and completely disappear by birth. In the postnatal eye, Cloquet's canal marks the former location of the hyaloid artery. After regression of the hyaloid artery, the lens receives all its nourishment from the aqueous humor. Nutrients diffuse in and waste diffuses out through a constant flow of fluid from the anterior/posterior poles of the lens and out of the equatorial regions, a dynamic that is maintained by the Na+/K+-ATPase] pumps located in the equatorially positioned cells of the lens epithelium. Glucose is the primary energy source for the lens. As mature lens fibers do not have mitochondria, approximately 80% of the glucose is metabolized via anaerobic metabolism. The remaining fraction of glucose is shunted primarily down the pentose phosphate pathway. The lack of aerobic respiration means that the lens consumes very little oxygen as well. Cataracts are opacities of the lens. While some are small and do not require any treatment, others may be large enough to block light and obstruct vision. Cataracts usually develop as the aging lens becomes more and more opaque, but cataracts can also form congenitally or after injury to the lens. Nuclear sclerosis is a type of age-related cataract. Diabetes is another risk factor for cataract. Cataract surgery involves the removal of the lens and insertion of an artificial intraocular lens. Presbyopia is the age-related loss of accommodation, which is marked by the inability of the eye to focus on nearby objects. The exact mechanism is still unknown, but age-related changes in the hardness, shape, and size of the lens have all been linked to the condition. Ectopia lentis is the displacement of the lens from its normal position. Aphakia is the absence of the lens from the eye. Aphakia can be the result of surgery or injury, or it can be congenital. ^ "Equator of lens - definition from". Biology-Online.org. Retrieved 2012-11-25. ^ "equator of the crystalline lens - definition of equator of the crystalline lens in the Medical dictionary - by the Free Online Medical Dictionary, Thesaurus and Encyclopedia". Medical-dictionary.thefreedictionary.com. Retrieved 2012-11-25. ^ Duker, Myron Yanoff, Jay S. (2008). Ophthalmology (3rd ed.). Edinburgh: Mosby. p. 382. ISBN 978-0323057516. ^ a b Candia, Oscar A. (2004). "Electrolyte and fluid transport across corneal, conjunctival and lens epithelia". Experimental Eye Research. 78 (3): 527–535. doi:10.1016/j.exer.2003.08.015. ^ Cvekl, A.; Ashery-Padan, R. (2014). "The cellular and molecular mechanisms of vertebrate lens development". Development. 141 (23): 4432–4447. doi:10.1242/dev.107953. PMC 4302924. PMID 25406393. ^ Cantù, Claudio; Zimmerli, Dario; Hausmann, George; Valenta, Tomas; Moor, Andreas; Aguet, Michel; Basler, Konrad (2014). "Pax6-dependent, but β-catenin-independent, function of Bcl9 proteins in mouse lens development". Genes & Development. 28 (17): 1879–1884. doi:10.1101/gad.246140.114. PMC 4197948. PMID 25184676. ^ a b c d Romer, Alfred Sherwood; Parsons, Thomas S. (1977). The Vertebrate Body. Philadelphia, PA: Holt-Saunders International. pp. 463–464. ISBN 978-0-03-910284-5. ^ Hecht, Eugene. Optics, 2nd ed. (1987), Addison Wesley, ISBN 0-201-11609-X. p. 178. ^ Hoehenwarter, W.; Klose, J.; Jungblut, P. R. (2006). "Eye lens proteomics". Amino Acids. 30 (4): 369–389. doi:10.1007/s00726-005-0283-9. PMC 2757602. PMID 16583312. ^ a b Andley, Usha P. (2007). "Crystallins in the eye: Function and pathology". Progress in Retinal and Eye Research. 26 (1): 78–98. doi:10.1016/j.preteyeres.2006.10.003. PMID 17166758. ^ Bloemendal, Hans; De Jong, Wilfried; Jaenicke, Rainer; Lubsen, Nicolette H.; Slingsby, Christine; Tardieu, Annette (2004). "Ageing and vision: Structure, stability and function of lens crystallins". Progress in Biophysics and Molecular Biology. 86 (3): 407–485. doi:10.1016/j.pbiomolbio.2003.11.012. PMID 15302206. ^ Mainster, M. A. (2006). "Violet and blue light blocking intraocular lenses: Photoprotection versus photoreception". British Journal of Ophthalmology. 90 (6): 784–792. doi:10.1136/bjo.2005.086553. PMC 1860240. PMID 16714268. ^ Anderson, Robert M. (1983). "Visual Perceptions and Observations of an Aphakic Surgeon". Perceptual and Motor Skills. 57 (3_suppl): 1211–1218. doi:10.2466/pms.1983.57.3f.1211. PMID 6664798. ^ Hambling, David (29 May 2002). "Let the light shine in". The Guardian. ^ Download and open with Inkscape 9.1. The separate components reside on different "layers" to facilitated editing. This page was last edited on 8 April 2019, at 01:26 (UTC).